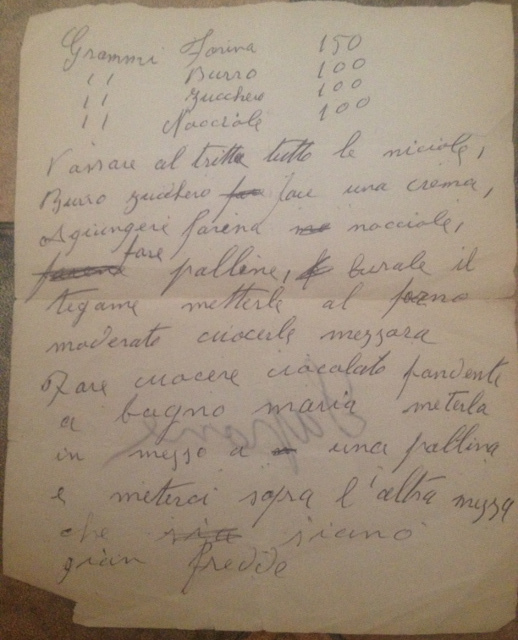 A few months ago I found an old piece of paper with a recipe for baci di dama biscuits. I’m not sure who wrote it and when, but the recipe was written on the back of a 40-year-old letter, so I guess that the recipe was written in the early ’70s. I tried it and the results were delicious! 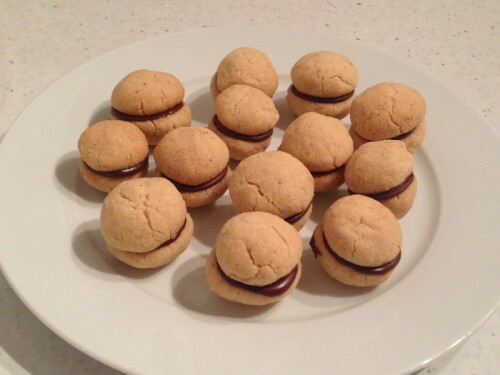 If you are wondering, a bacio di dama (lady’s kiss) is a biscuit made with two hazelnuts biscuits that are stuck together with chocolate, so that the two halves “kiss” each other. Like most Italian recipes with hazelnuts, baci di dama come from Piedmont. If you don’t have a food processor, you can also use ground almonds instead of hazelnuts. Put the hazelnuts and the sugar in a food processor and reduce to a fine powder. In a bowl, mix with your fingertips the hazelnut and sugar mixture, the flour, and the butter cut into pieces. You will end up with a mixture looking like coarse breadcrumbs. Work quickly and don’t overmix or the biscuits will come out very hard. Press the mixture to form a ball, wrap in cling film and put in the fridge for at least 30 minutes. Preheat the oven at 160 °C/320 °F. Cover an oven tray with greaseproof paper or aluminium foil. Make little balls (½ inch large) of dough with your hands; even if the dough looks like crumbles, it should easily stick together when you press it. Put the balls on the tray leaving some space between them. Bake the biscuits until golden, about 30 minutes. Melt the chocolate in a metal bowl or pot set over a bigger pot of barely simmering water, stirring occasionally, until smooth. Put a small amount of chocolate on the flat part of a biscuit and then top with another biscuit pressing slightly. Let the biscuits rest until the chocolate is firm. This entry was posted in desserts and tagged almonds, baci di dama, chocolate, hazelnuts, lady's kisses, piedmont, piemonte by Marco Barisione. Bookmark the permalink.